The association between France and Germany that has produced the Transall began when the German aircraft industry built the Nord 2501 Noratlas under licence for the Luftwaffe. The successful co-operation between the Weserflugzeugbau GmbH and Nord Aviation on the Noratlas programme led to both companies studying a follow-on project for this old-fashioned twin-boom piston-powered medium transport. The "Transporter-Allianz" was formed in January 1958 by the participating companies, Transall being an abbreviation of the name, while the letter "C" stood for "Cargo" and the figure "160" for the equivalent wing area of 160 square metres. The joint team designed a tactical cargo and troop transport in the 50-ton category to fulfil the joint requirements of the French and German forces, with the capability of hauling a 17,600-1b (8 000-kg) payload out of semi-prepared fields over a radius of 750 miles (1200 km) without refuelling. After several individual concepts had been studied separately in both countries, the Transporter Allianz concentrated on a shoulder wing design with two Rolls-Royce Tyne 20 Mk 22 turboprops of 6,100 eshp each, with a rear loading ramp and a kneeling landing gear to lower the fuselage for loading. According to the bi-national contracts signed in December 1959 and March 1960, the R & D costs were to be divided equally between France and the Federal Republic of Germany while each country would pay for the number of aircraft ordered for its specific needs, and final assembly lines would be established in each country. The first prototype, the C-160 V 1, was assembled in France and made its maiden flight on 25 February 1963 at Villaroche, the V2, assembled by VFW-Fokker, following exactly three months later at Lernwerder; the V3 flew on 19 February 1964 in Hamburg, (two separate assembly lines having been set up in Germany by MBB and VFW). Also in 1964, the airframes for static and dynamic tests were completed. An additional six pre-series aircraft were built before production started, with the first delivery on 2 August 1967. France had meanwhile ordered 50 Transalls (C- 1 60F), Germany ordered 110 (C-160D), 20 of these being later passed to the Turkish Air Force (as C-160T), and the Republic of South Africa bought another nine (C-160Z). The six pre-series aircraft were divided between France and Germany. As far as the production breakdown is concerned, Nord Aviation was responsible for the wings and engine nacelles, Hamburger Flugzeugbau (HFB) built the front and rear sections of the fuselage and Vereinigte Flugtechnische Werke (VFW) the central fuselage and the horizontal tail surfaces. Some wing parts and the flaps were sub-contracted to Messerschmitt and Siebel ATG while Dornier built the vertical tail surfaces. The Messier-designed landing gear was coproduced with Liebherr-Aerotechnik. Rolls-Royce cooperated with Hispano-Suiza (now a branch of Snecma, France), MAN (later Motoren und Turbinen-Union, Munich) and FN (Belgium) in manufacturing the Tynes. Ratier-Forest in France produced the big 18-ft (5,49-m) diameter four-bladed de Havilland propellers and Normalair (UK) delivered the pressurisation and air conditioning systems. VFW was the lead company in the programme. The shape and dimensions of the fuselage were essentially designed to conform with the "International Railway Loading Gauge" over the entire length of the hold. The length of the compartment including the ramp is 56 ft 6 in (17,21 m), the useful width is 10 ft 4 in (3,15 m) and the max useful height 9 ft 9 in (2,98 m). The floor area is 583,9 sq ft (54,25 sq.m), giving a usable volume of 4,940 cu.ft. (140 cu.m). Thus, a total of 178 Transalls had been produced when the last aeroplane rolled off the assembly line in October 1972. Deliveries totalled 52 C-160F for the Armee de l’Air (four modified as 160P civil night mail transports), 110 160D for the Luftwaffe (20 later transferred to the Turkish air force and 32 stored) and nine 160Z for the South African Air Force. The Transall C-160 was designed for flexible payload-range capabilities and stringent mission requirements. These include high gust and manoeuvre loads of 3 g at low level, as well as high static loads on landing gear and structure encountered in rough, semi-prepared field operations. The fuselage is built in three units, with the usable section designed for an operating pressure of 4.7 psi. In the centre section of the fuselage, seven main wing-fuselage frames made of forged and plate components carry the loads from the wing and the landing gear. The fuselage skin is stiffened by extruded Z section stringers. Heavy corrugated aft-fuselage frames in the tailplane take up the forces from the tail unit and the aft upward hinged cargo door. The wing comprises three major components, a parallel chord centre section to which are bolted two tapered outer panels. The primary structure is a wing torsion box with two shear-web spars to which are attached the leading- and trailing-edge sub-assemblies. The upper and lower wing skin panels are stiffened with longitudinal extruded T-section stringers. Double-slotted flaps, spoilers, airbrakes and ailerons make up the moving surfaces of the wing. The tail unit consists of a three-spar, fully cantilevered horizontal stabiliser and a three-spar fin torsion box with stiffened skin construction. Elevator and rudder are of the same conventional construction. The dorsal fin consists of aluminium sandwich flat panels. The main landing gear has eight wheels, with two tandem pairs of wheels on each side. Together with low pressure (55 psi) tubeless tyres sized 15.00-16, the resulting single wheel loads provide the aircraft with an excellent ability for operations from semi-prepared or unprepared strips. The twin-wheel low pressure (45 psi) nose gear is hydraulically steerable through 55 deg each side. To ease loading procedures from ground or low levels, the main landing gear may be kneeled, ie, partially retracted, thus changing the ramp slope-angle with respect to the cargo compartment floor-line. The system is operated by special built-in shock absorber-jack cylinders through power supplied by one of the engines, APU or hand pump. Aerospatiale, MBB and VFW, decided in May 1976 to reinstate the production of the twin-turboprop Transall C-160 tactical transport. The French Armee de l’Air was at that time showing interest in buying 25-30 aircraft, and an industrial agreement was signed on 29 October 1976, it being then estimated that an order backlog of at least 75 aircraft would be needed to make the new programme an economic worthwhile enterprise. 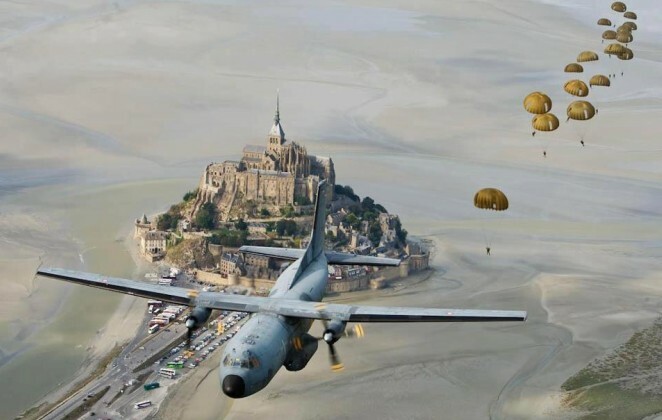 The French Government therefore decided in July 1977 to approve the launching of the second series of the Transall C160 and ordered 25 aircraft for the Armee de l’Air. The only large aeroplane in Europe to be built on a re-established production line, having been designed in the mid-'fifties. Under the new industrial agreement for the second series, rather different arrangements have been made, there being no main contractor. Aerospatiale and the two German manufacturers VFW and MBB - all three original members of the Transporter-Allianz having changed their status as a result of mergers in the last decade - share the work on a fifty-fifty basis, now with a single assembly line at Toulouse. Aerospatiale is building the wings, fuselage doors, emergency exits and engine nacelles. The manufacture of the front and rear fuselage sections including the loading ramp and the dorsal fin is undertaken by MBB. VFW (itself now in process of merging with MBB) produces the centre fuselage, main landing gear fairings and all main tail surfaces. Unchanged from the previous arrangement is the share of production of the Tynes, jointly manufactured by Rolls-Royce, Snecma, MTU and FN. As in the Airbus programme, all the major airframe parts are airlifted from the manufacturing centres in Germany to Toulouse in a Super Guppy transport, for final assembly and flight testing. No major modifications have been incorporated in the C160 design, but the list of changes in many details is quite impressive. The forward side loading door is deleted and the deicing system improved. Minor changes affect the landing gear as well as the cargo handling system. New bonding techniques are applied and corrosion protection is improved. Structural provisions are made for additional fuel tanks in the wing centre section to allow for a total of 6,170 Imp gal (28 050 lt) instead of 4,190 Imp gal (9 050 lt) with the original outer wing tanks only. This not only provides for an extended range of 4,780 nm (8 854 km) for ferry flights, but also sufficient fuel capacity for aerial refuelling tasks which are new for the aircraft. Ten of the 25 new Transalls are to be equipped with hose and drogue in-flight re-fuelling systems in the lengthened port main landing gear fairing, to serve as tankers; another five will have provision for this equipment and can be rapidly adapted to the tanker role if required. All the 25 aircraft can be refuelled in flight, using a 13 ft 1.5 in (4-m) long probe installed above and behind the flight deck. The flight deck is designed for operations by a crew of three. As an optional extra it accommodates a swivelling seat for special tasks. The exceptionally spacious flight deck also has two berths in addition to the crew seats. The field of vision from the pilot's position is 243 degrees. Although the Transall C-160 is specially designed for carrying troops and cargo, it is also capable of fulfilling a variety of other missions. With a maximum payload of 3 5,270 lb (16 000 kg), the range is 1,000 mls (1850 km), increasing to 2,750 mls (5 100 km) for a payload of 17,640 lb (8 000 kg); the maximum range for ferry flights is 4,780 mls (8 850 km). Fuel consumption with both engines operating varies from 2, 100 lb to 2,755 lb (950 kg to 1250 kg) per hr and the manufacturer claims that this figure is about 30 per cent better than its competitors on a given mission. As a cargo transport, a variety of heavy or outsized loads can be carried. This includes most military vehicles, airmobile tanks, armoured cars, missiles, partially disassembled helicopters and aircraft. An automatic latching system and easily adjustable rails and rollers permit quick-loading of pallets in standard sizes such as 88 in x 125 in (2,24 m x 3,18 m), 88 in x 108 in (2,24 m x 2,74 m), etc, standard inter-model 8 ft x 8 ft (2,44 m x 2,44 m) containers as used on trucks, railways, ships and wide-body aircraft, or 12 LD3 containers. Reinforced vehicle treadways allow for carrying vehicles with axle loads of up to 11,023 lb (5 000 kg) and freight loads of up to 205 lb/sq ft (1000 kg/sq.m). Air dropping of heavy loads (up to 17,640 lb/8000 kg single loads) is possible either by gravity release or parachute extraction. Deliveries of the Transall C-160 (Second Series), which first flew on April 9, 1981, were completed in 1985. The sole military customer was the French Air Force, which ordered 25 with updated avionics, a strengthened wing centre section incorporating an additional fuel tank, and in-flight refuelling capability. Ten are equipped as dual-role single-point tankers, and five more have the necessary modifications to allow rapid conversion to the tanker role. In 1982 four additional aircraft were ordered for the French Air Force, two as secure communications relay platforms known as C-160A Astarte for the nuclear deterrent force from 1987, and two Gabriel electronic intelligence aircraft. Max range with outer wing fuel only, 3,430 nm (6 353 km), with centre section tanks, 4,780 nm (8 854 km).